Mahasivarathri in February-March, Margazhi Tiruvadhirai in December-January, Panguni Uthiram in March-April and Tirukarthikai in November-December are the festivals celebrated in the temple. The rays of Sun fall on the Shivalinga in Aavani on 19, 20 and 21 (August-September). The temple is open from 6.00 a.m.to 10.00 p.m. and 5.00 p.m. to 8.00 p.m.
Sri Sundareswarar Temple, Neikuppai, Thanjavur district. 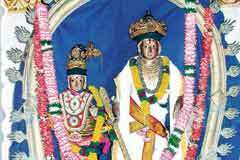 Sri Tirumangaicheri Varadaraja Perumal and Sokkanathaswami temples are very near to this temple. There are shrines for Lord Sri Varadaraja and Lord Sri Narasimha in the temple. Devotees pray for removal of obstacles in marriage proposals, child boon and progress in education. Devotees perform special abishek and offer Vastras to Lord and Mother. During His incarnation as Narasimha, spark spots (Agnikolam) appeared on earth. When Mother placed her steps on earth, the heat subsided and lands became cool. Rains too helped. Seeing Himself the unbearable heat that occupied the earth and suffering of beings, Lord Narasimha took the form Lord Varadaraja to protect lives from the heat. He came to this place. When Lord left, Sri Mahalakshmi came to Karupathur near Tiruchi which was a forest then. She performed penance on Lord Shiva to get Her Lord. With the grace of Lord Shiva, Sri Mahalakshmi came to Tirumangaicheri and had the fortune of seeing Her Lord as both Narasimha and Varadaraja. Neikuppai: The name appears to be very different. However, the story goes that when Mother Ambika came here as a cow, She poured the milk in a well, also called Koopam in Tamil. The milk changed into ghee (Nei). The well then became to be known as Neikoopam (Ghee well). The name slowly changed as Neikoopam and is called Neikuppai now. 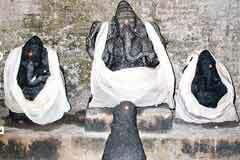 Also Sun God worships the Lord Sundareswara by placing his rays on the Shivalinga on 19, 20 and21 of Aavani (August-September) repenting for some wrongs committed by him. 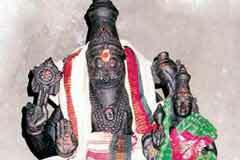 The history of the temple and those of Tirumangaicheri Varadaraja Perumal are boons for the devotees. This is also a sacred land with an ant-hill offering all relief to those afflicted with Naga doshas – adverse aspects of snake planets. It also may be recalled that a Pandya King embraced Jainism. His queen Mangayarkarasi took all the pains to bring him back to Saivism. 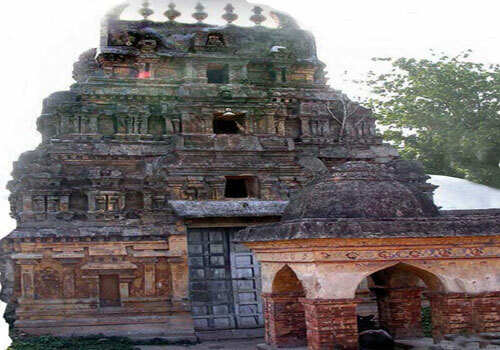 She built the Tirumangaicheri temple, her place of birth. Following her Chola tradition, she named the Mother Soundarya Nayaki as Meenakshi belonged to Madurai. Lord is Sundareswarar. This is a very sacred place. Lord Shiva wanted to dispatch the Vedas to Earth through Mother Umadevi. He made the essence of Vedas in the shape of balls representing the planets. Mother played with these balls throwing them up and down and spread the vedic message to all places. The brilliance and brightness of Sun too dimmed before the light of Vedas. He did not want to create any hindrance to the playing of the mother and postponed his setting time. This caused many difficulties in puja timings in temples and other worldly activities. Pretending to be angry on this change, Lord Shiva appeared before the Mother Ambika. She stood still. The Vedas, unable to bear the anger of the Lord simply stayed on the space. Lord told the Mother that as her playing with Veda balls changed the timings of Sun set and caused confusions, She must go to Earth and spread the Vedic message as her feet had the essence of Vedas. Ambica felt that it could not be possible to undertake the journey by walk, sought the help of her Brother Lord Vishnu, who has the reputation of saving the Vedas from demons as a Varahamurthi. He came to Earth as Nandagopala with Ambika. The first step that Mother Ambica placed on Earth is today’s Neikuppai. Scientific Based The rays of Sun fall on the feet of the Lord on 19, 20 and 21 in Aavani month – August-September. Neikuppai is 25 km on Kumbakonam to Panthaloor road.